An environmentally-friendly, waterless body soap has led to a local young man being named by TIME as one of the adults busy changing the world. We love a great invention. Even more so when it's something done by an enterprising South African. We're particularly proud of a young Capetonian whose impressive creation landed him on TIME's list of Top 30 young adults under the age of 30 who are changing the world. 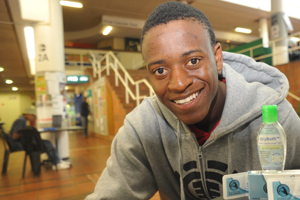 Ludwick Marishane (23) of Cape Town made the influential TIME list for his environmentally friendly, waterless body soap . Marishane, who is originally from Mpumalanga, succeeded in landing a place in the science category with his product, DryBath. DryBath is a body soap which is used without soap and is also kind to the environment. The TIME panel, which is made up of various editors, said the soap would “make a big difference in the lives of South Africans living in rural areas where it is difficult to get clean water”. DryBath is the world’s first antiseptic soap that doesn’t require you to jump under the shower once you’ve applied it. This addresses a global problem, because about 2 billion people do not have ready access to water. Marishane wrote on Facebook that he was “honoured by the nomination”. Another young African who also made the list is 26-year-old Arthur Zang of Cameroon. He developed a medical computer tablet which could save lives in rural Africa. Zang’s Cardiopad allows patients in remote areas to undergo heart tests then sends the results to specialists wirelessly. This means patients will no longer have to undertake expensive journeys to the big towns.